Kentucky has played organized basketball for over 100 years, and during that time the rules, players and the game itself have changed dramatically over the decades. The wide range of facilities (both on campus and off), from the earliest humble gymnasiums of yesteryear to the gigantic and extravagant domes and arenas of today have also undergone dramatic changes. Going back through time to view how these facilities have evolved gives insight into how the game itself has changed with the times. Often the upgrades in facilities have been an attempt to keep in step with the increased interest in the sport, while at other times new facilities have themselves laid the groundwork and spurred popularity of the game. Beyond reflecting interest in the game, changes in the facilities also serve to highlight other factors which have proven important in the game's development, such as effects from political decisions, economic drivers, and cultural influences on architectural style and aesthetics. Below are some short descriptions of selected gymnasiums and arenas during notable time periods found during the development of the game, along with graphic examples illustrating the style of the day. Each of these buildings have hosted games that the Kentucky basketball team has been a part of. For a more complete listing of arenas Kentucky has played in, please consult this list. To fight urban decay and to upgrade older 30's era municipal arenas, a number of cities built new multi-purpose arenas in the 1970s, mainly for the purpose of hosting NBA and NHL teams. Many of these stadiums built during this era (along with baseball and football stadiums) were criticized for having a lack of architectural imagination and often following a cookie-cutter design. The focus of these arenas was to fit as many seats as reasonably could fit with little attention to other amenities and services beyond the basics. 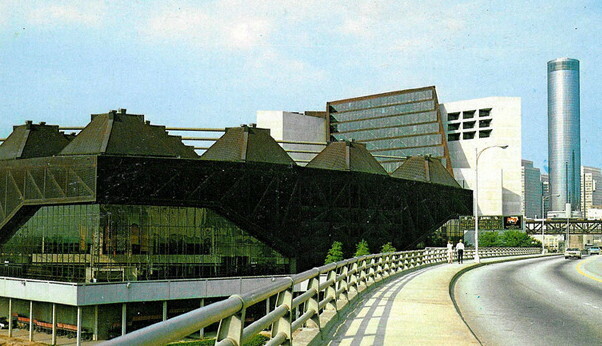 The Omni in Atlanta opened in 1972 and has since been replaced by Philips Arena. 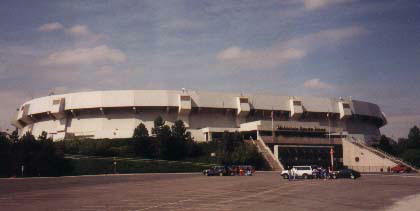 Riverfront Coliseum in Cincinnati was built in 1975 and went through a number of name changes. The venue hosted a number of games Kentucky played in Cincinnati. McNichols Arena in Denver opened in 1975. Joe B. Hall coached his final game there in 1985. The Spectrum in Philadelphia was the site of one of the most memorable games in NCAA Tournament history, Kentucky vs. Duke in the 1992 East Regionals. Brendan Byrne Arena was another facility that went through a number of name changes through the years. It was the site of Kentucky's sixth national championship in 1996. 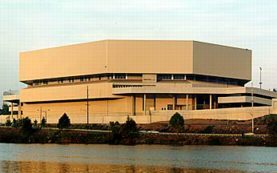 During the 70's and 80's, a few schools began to outgrow their facilities and looked at constructing larger arenas designed primarily for basketball which could accomodate greater than 20,000 fans. The additional seats required an upper deck, with many of the seats relatively far from the court. Rather than style or comfort, the main goal was to pack as many seats around the court as possible. The costs were prohibitive for many and the fan following not so strong, which explains why only a few schools chose this route. 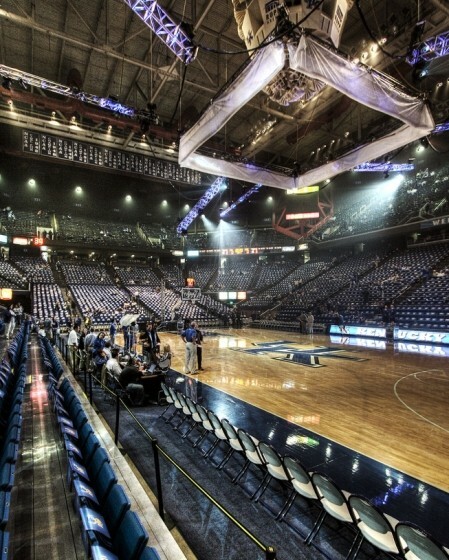 Kentucky's Rupp Arena with a stated capacity of 23,000 (although oftentimes filled upwards of 24,500) was built in 1976 and named in honor of UK coaching great Adolph Rupp. It is located off-campus in downtown Lexington and was intended as a hub of urban renewal, with mixed results. The Dean Smith Center was named after North Carolina coaching great Dean Smith. The facility opened in 1986 and seats over 21,500. Tennessee's Thompson-Boling Arena was Tennessee's answer to Rupp Arena. The school often struggled to fill its seats, but it has come in handy to the UT women's program and during the few times Tennessee is a national contender. Rather than construct large basketball-only arenas which were economically questionable, a different tact that became popular for showcasing high profile games (including games in the NCAA Tournament) has been to hold basketball games in domed stadiums and similar facilities which were primarily designed for football. 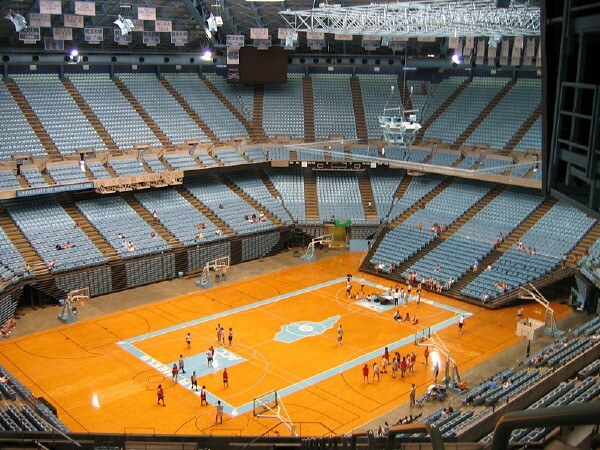 Oftentimes, the basketball court is placed in a corner of the stadium and large expanses of the remainder of the stadium are cut off by temporary bleachers and/or curtains. The large open space is oftentimes a distraction to the players as it presents issues with depth-of-field while shooting. Due to the vastness of the facility, it's possible to have huge crowds be present for games, which boosts ticket revenue, even if many in the crowd are sitting in seats far away from the action or with less than optimal sight-lines. This leads to a reliance on video boards to make out the action on the floor. 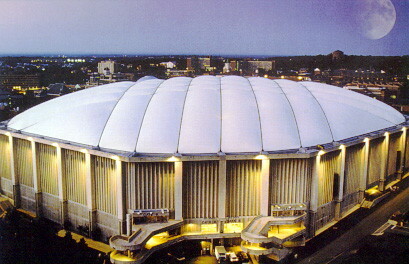 The Carrier Dome in Syracuse NY is unique, not only because it's a collegiate dome, but because it is actually located on the Syracuse University campus proper. The Alamodome in San Antonio Texas served as the host of the 1998 NCAA Final Four, where Kentucky claimed their seventh national championship. The Edward Jones Dome (aka Trans World Dome) in St. Louis was opened in 1995 and has served as a host of a number of NCAA regionals. The Georgia Dome in Atlanta has been a favorite location for the Southeastern Conference Tournament. The Hoosier Dome (aka RCA Dome) in Indianapolis opened in 1984 and could seat over 47,000 for basketball games. It briefly served as the host of the Big Four Classic before Kentucky and Indiana discovered they could cut out Notre Dame and Louisville and sell out the arena between themselves. The Dome has since been demolished. Tropicana Field (aka Thunderdome) in St. Petersburg FL is one of the more interesting domes architecturally, as it resembles a partially eaten orange. The massive New Orleans Superdome can hold over 75,000 for basketball and has hosted SEC and NCAA games Kentucky has participated in. It soon became apparent to many schools looking to upgrade their facilities that building a basketball arena with capacity greater than 20,000 was problematic, as it would cost more and be more difficult to fill, while the sight-lines were not great either. Many schools opted for more modest arenas in the 14,000 - 19,000 capacity range, although they refined the experience, including at times luxury boxes. The Breslin Center in East Lansing MI was built in 1989 and seats just over 15,000 fans. Arkansas' Bud Walton Arena was built in 1993. 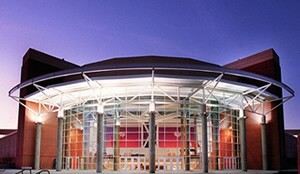 South Carolina's Colonial Center opened in 2002 and has a capacity of 18,000 fans. 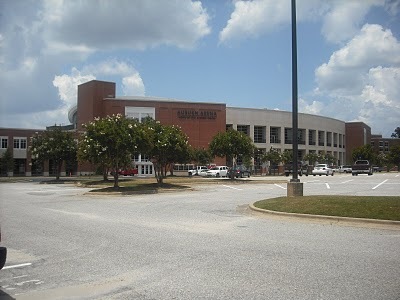 Auburn's new arena became available starting in the 2010-11 season. It seats 9,600 and includes luxury boxes. Modern NBA arenas have also seemed to limit themselves near the 20,000 capacity mark. Instead of striving for maximizing the number of seats, modern arenas have focused on corporate box suites and other amenities. In addition, a number of schools in major cities have opted to form partnerships with municipalities and build NBA-quality arenas off-campus which could better serve the needs of the community, and potentially attract professional teams. Although it had been done in the past sporadically, most every new arena built today also courts a corporate sponsor who pays large sums of money for naming rights. 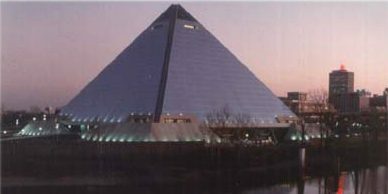 The Pyramid was built in 1991 and is one of the more unique arenas of modern times. It served as the home floor for the Memphis Grizzlies and the University of Memphis, before they left for the FedEx Forum. 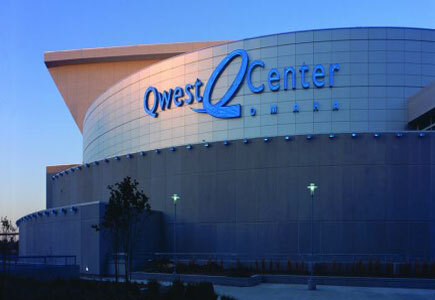 Qwest Center in Omaha Nebraska was built in 2003 and serves as a municipal auditorium and home of the Creighton Bluejays. Philips Arena in Atlanta was built in 1999 with a capacity of 20,000. It serves as the home of the Atlanta Hawks. 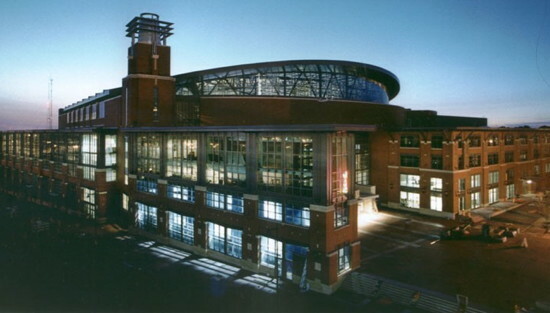 Nationwide Arena in downtown Columbus OH serves as the home of the Ohio State Buckeyes. Bridgestone Arena [aka Gaylord Entertainment Center and Sommet Center] in Nashville TN recently hosted the 2010 SEC Tournament. The facility was built in 1996 and seats nearly 20,000 fans. 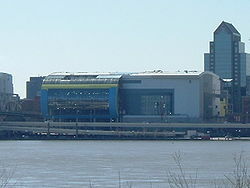 The St. Pete Times Forum [aka The Ice Palace] hosted the SEC Tournament in 2009. 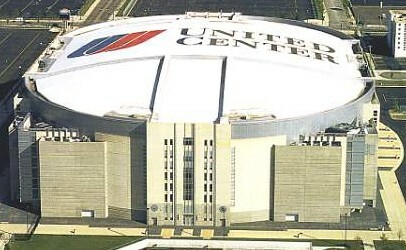 The United Center in Chicago is the home of the Chicago Bulls, replacing the old Chicago Stadium. The KFC Yum! Center is an NBA-quality arena for the city of Louisville and serves as the home court for the Louisville Cardinals. 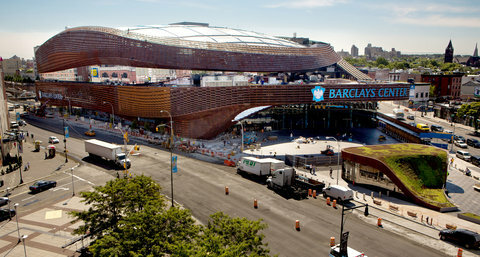 The Barclays Center in Brooklyn NY is considered a premier modern arena. What the future holds remains to be seen. Despite Kentucky pushing the envelope with Rupp Arena in the 1970s, most schools could not find it economically feasible (either due to lack of money or fan disinterest) to follow Kentucky's example and build a facility with that much capacity. It appears that the current sweet spot for most basketball arenas (both collegiate and professionally) is building facilities with capacities between 17,000 and 20,000 fans. Just as importantly, most new facilities include accommodation for luxury boxes which generate large amounts of revenue. That formula seems likely to continue for the foreseeable future. The NCAA seems to be content with holding important tournament games (such as regionals and the Final Four) in large football stadiums which have been converted to accomodate basketball courts, even if the sight-lines for fans and the players are less than optimal. This allows for maximum revenue even though it may adversely affect the quality of the games themselves. 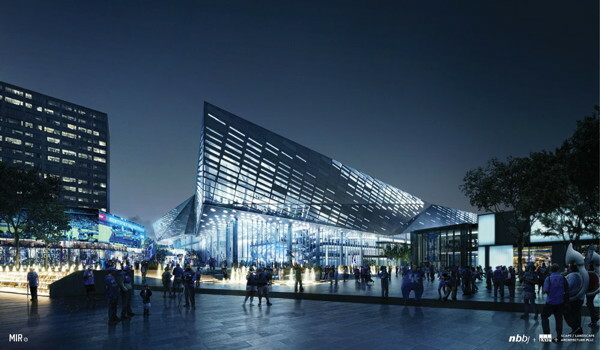 Whether Kentucky again pushes the envelope by building yet another basketball-targeted facility with an even larger capacity to replace Rupp, or makes a major renovation of the existing Rupp, remains to be seen. 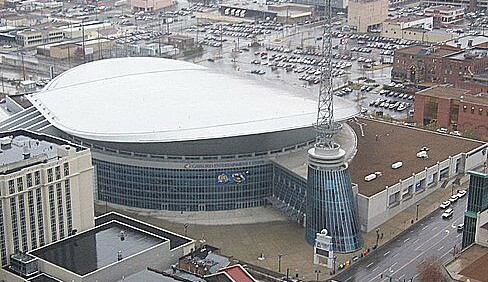 Potential upgrade for Rupp Arena ? Back to top. Return to Part 1: Early Gymnasiums. Return to Kentucky Page, statistics, teams, opponents, players, coaches, opposing coaches, games or search this site.